My time living & working on Mackinac Island has left me with a bizarre fascination with little islands. There are dozens of them on my list of places I want to go, scattered all over the world. There’s something intensely unique about an island. Each one is its own little world, especially if the only way to get to it is by plane or ferry. I was also discussing plantations on Facebook this week. I admit that I think the houses themselves are really cool, and of course they’re interesting and important from a historical perspective, but they’ve been way over-romanticized. “Come have your wedding at this place that was built on the backs of slaves!” Yeah…no. Maybe people just can’t really connect with the slavery aspect as something that actually happened to actual people, I don’t know. Speaking of historical perspectives, I hope all my teachers like the in-depth historical backgrounds of everything, because I can’t stop writing that way even when I’m supposed to be working in the present. Good thing I’m going into archaeology, they appreciate historical perspective. I signed up for my LAST SEMESTER of classes! I’m taking Digital Archaeology in the fall and I’m REALLY excited about it. I also managed to test into second semester German, so my little bits of studying over the last few years actually got me out of a whole class! Gamble Plantation Historic State Park, Ellenton, FL – only plantation house left in Florida. Ushant Island, France – westernmost point in France; also sheep, lighthouses, seafaring history, etc. Hampi, India – ruins of Vijayanagara Empire’s capital, UNESCO World Heritage Site. Hudson Highlands State Park, Cold Spring, New York – lots of hiking trails. Cornish Estate Ruins, Cold Spring, New York – abandoned mansion in the woods. Also apparently the Hudson River Valley is just packed with amazing ruins. I don’t know why I’m surprised, there’s already several of them on my travel list. Round Island is part of Hiawatha National Forest, is entirely uninhabited, and really doesn’t have any tourism to speak of. Occasionally someone will take a kayak across the channel, or we’ll see a bonfire on the beach, but for the most part it’s pretty forlorn, the lighthouse locked up tight, nobody around. One day a year the Round Island Lighthouse Preservation Society, together with Boy Scout Troop 323 of Freeland, Michigan, open it up for tours. The tour itself is free, but if you don’t have your own way across transportation from Mackinac costs $15. First they put seven people into a smallish fishing boat, then they transferred us into two inflatable Zodiac rafts. I wish I’d been wearing lighter pants, I was siting right in the bow and my jeans didn’t get dry the whole time I was there. Waiting on the dock we are joined by some geese hoping for handouts. Nobody really took care of it from the time it was decommissioned in 1958 until a storm swept away a whole corner of the building in 1972, and people started to realize they might lose it forever. They kept it from collapsing then but the interior is still in desperate need of reconstruction. Holes in the walls, holes in the floors, but it’s a beautiful building. Boy Scouts throughout the building talked about the history all the way up. The first floor housed the two massive compressors that created steam to run the foghorn, the second and third floors were living quarters for the keeper, his assistant, and their families. Some of the bedrooms had the foghorn right outside the windows – I’m sure that was fun to sleep through. On the fourth floor there’s just a ladder up into the lantern room, and from there a tiny hatch opening out onto the deck. Compressor used to create steam for the foghorn. The rounded ceiling of the compressor room helped minimize noise in the living quarters directly above. Handcarved details in the stairwell. Looking back toward Mackinac. The rooms just inside from the foghorn were once bedrooms. Good luck sleeping through that! The ceiling of the lantern room. The fresnel lens in the lantern room. The tiny hatch that gives access to the deck from the lantern room. Looking out over the rest of Round Island. While I was there a woman named Gertie came to the island. She’s 90 years old, and her father was once the lighthouse keeper. She spent a handful of summers living here as a girl, and sat for a long time telling us about carrying water up from the lake, the things her sisters found walking the beach, and making whatever fun you could in such a lonely place. We moved into what had once been her bedroom, and while she spoke a floorboard broke out from under her daughter’s foot. Going inside Round Island Light is a rare opportunity, and one that I passed up too many times. I probably spend three hours wandering through it and listening to Gertie’s stories. It would be nice to see it restored someday, but the money and effort involved with such an undertaking may be too much. In the meantime we’ll just have to love it as a beautiful ruin. Drive an hour from St. Ignace, to the very eastern corner of the Upper Peninsula, onto the Drummond Islander IV in De Tour Village, and land in paradise. Paradise with nobody in it. Paradise with cool abandoned stuff. Paradise with lots of trees & wildflowers. Ferry passage for a car and the driver is only $14. It was shocking how much stuff they put on that boat – cars towing boats, fifth-wheel campers, I even saw a semi towing a huge excavator waiting to board. I spent two nights at the semi-rustic Township Park campground, a spot with electricity is $16/night. 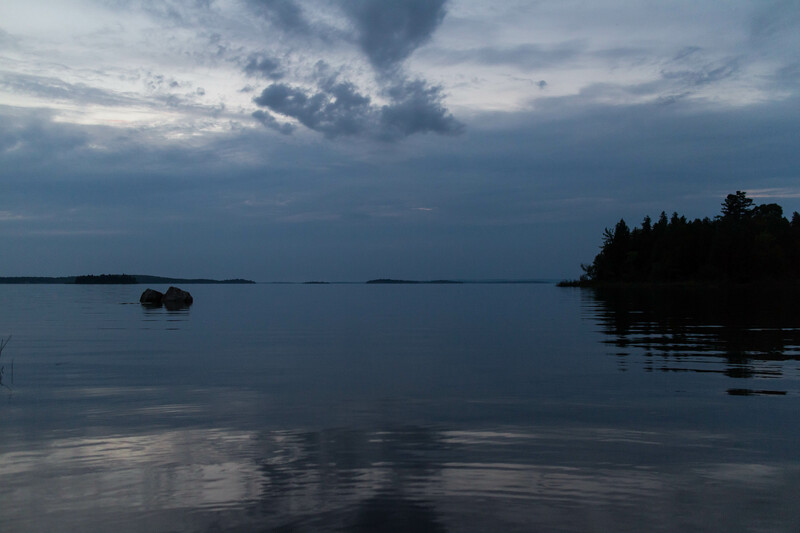 The first night I couldn’t sleep, so I laid awake listening to loons call. Bring a canoe or kayak if you’ve got one, there’s all sorts of little outlying islands, including Harbor Island National Wildlife Refuge. There’s also plenty of hiking and four-wheeling trails. A lot of roads on the map unfortunately are signed as private roads, so I couldn’t explore as much as I wanted to :(. There’s no shortage of services here, the main intersection in town has a grocery store, hardware store, and dry goods shop that all seem to be owned by the same family, and there’s plenty of restaurants, hotels, and campgrounds. I think the gas station had as wide a variety as our grocery store here on Mackinac.